The Official UK Album Chart Top 100 published yesterday (Friday 5th January) revealed that "Wembley Or Bust" by Jeff Lynne's ELO has fell an astonishing fifty six places from #40 to #96 this week (after seven weeks in the chart) whilst "All Over The World" has slipped from #50 to #53 (having clocked up a 174 week chart run to date). 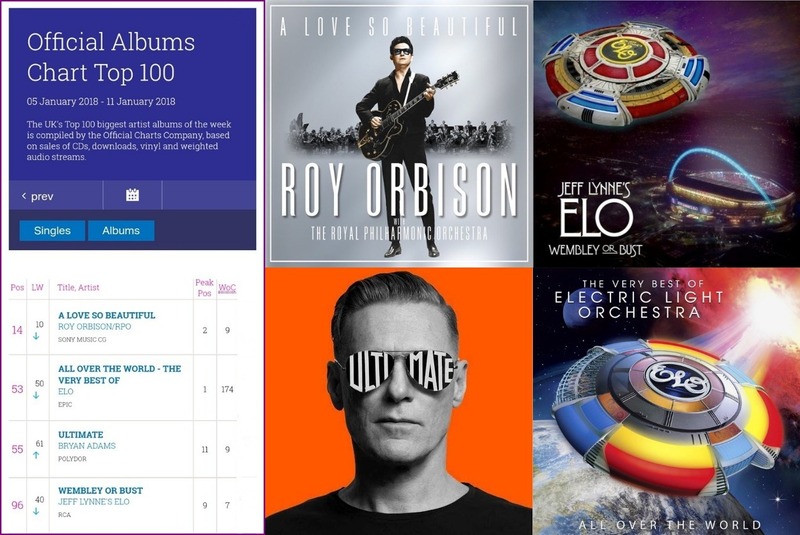 Elsewhere, Roy Orbison's orchestral overview "A Love So Beautiful" has exited the Top 10 in dropping from #10 to #14 and Bryan Adams' latest career compilation "Ultimate" has nudged up another six places from #61 to #55 meaning that ELO maestro Jeff Lynne has a hand (just about) in four Top 100 albums this week. Meanwhile, over in the Official Singles Chart, Wizzard and "I Wish It Could Be Christmas Everyday" have left the Top 100 after reaching a heady #15 last week. elobeatlesforever (elobf) recommends "Wembley Or Bust" and "All Over The World" to those enlightened folks who enjoy the music of ELO, Jeff Lynne, Roy Wood, The Move, The Idle Race, 'Brum Beat', The Beatles and related artistes.